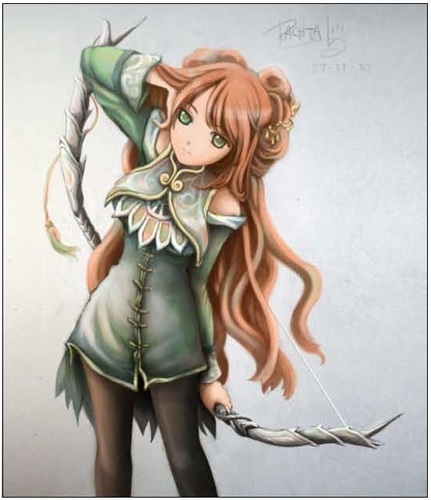 The only daughter of a human father (Orin) and elven mother (Catriona or 'Cat' to her father), Avery is a spritely half-elf with long, golden-red hair and wide, green eyes. She was born on 1345 Mirtul 11. Growing up surrounded by nature, she has come to love the forest and its animals with boundless devotion. She has spent her entire childhood becoming one with her surroundings and can move through the forest at will and track anything that passes through it. Avery's mother is one of the small number of elves who have chosen to remain in Cormanthor Forest, steadfast in loyalty to what is theirs. With this fervor passed down from her mother, Avery has chosen to remain as well, guarding the forest, tracking those who should not be there and defending it whenever necessary. Just after she was born, Avery's parents — knowing that the forest was becoming increasingly dangerous for those of elven blood — brought home an Elven Hound as her companion and protector. Avery has grown up with Aindreas Ra'huan of the Eladrin. However, as Avery was just a baby when he was brought home and she was unable to pronounce his given name, he came to be called what he is: Cooshee, the Elvish word for these hounds. Avery and Cooshee are inseparable; he provides constant protection. Avery has also been trained by her father in the art of the bow. She now wields a longbow considered a family heirloom: Taulmaril (The Heartseeeker). Until she joined with the Knights of Daggerdale, Avery's adventures took place within Cormanthor Forest and involved interlopers, those who would harm the forest and its inhabitants and Drow. Avery's encounters with Drow, as well as her study of her fellow elves, have given her particular insight and knowledge into them. She has worked closely with Alok Silverspear on several occasions in battles to defend the forest. During one such Forest adventure, the battle brought outside defenders to the forest as well and introduced Avery to Gwendolynn Fairbarin, a halfling druid. They quickly developed a friendship and have stayed in touch whenever possible.